“My children, listen to me. Listen to your father’s instruction. Pay attention and grow wise, for I am giving you good guidance. Don’t turn away from my teaching” (Proverbs 4:1-2). Some have received positive instruction, such as that spoken of in Proverbs 4, from their earthy fathers. Others have not. Fortunately, everyone can receive perfect advice from their Heavenly Father as He fills the gaps in our lives. 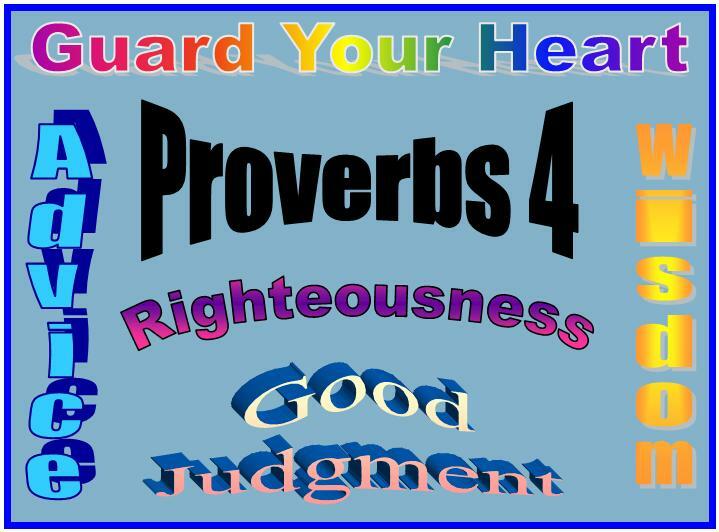 Instructions for “the way of righteousness” make up Proverbs 4, telling us how to have “life and radiant health.” Let’s look at five points made by Solomon as he passes on what his father David once told him about living a holy life. Learn to be wise. Verse 7 tells us that this is “the most important thing you can do.” How does wisdom begin? Proverbs 9:10 tells us wisdom starts with “the fear of the Lord.” This means learning what God hates and not doing it and learning what He desires and doing it knowing that one day we will be held accountable for our attitudes, actions and words. Develop good judgment. Good judgment follows wisdom and could be described as the ability to apply wisdom. Good judgment involves learning from mistakes (your own as well as others), having patience, and continually seeking wisdom. Good judgment allows for the development of a clear conscience (2 Timothy 2:15) and involves following good examples (1 Corinthians 11:1). Guard your heart. As we’ve already noted, wisdom is the top priority. Interesting that verse 23 of Proverbs 4 says that guarding your heart is the top priority. Perhaps this means wisdom and guarding one’s heart are closely connected and perhaps even one in the same. Ephesians 6:14 instructs us to put on the “breastplate of righteousness.” This means that righteousness (right living) protects our hearts. Wisdom allows us to have good judgment to live right which then protects our heart. So, the way to guard your heart is through wisdom. Know what to avoid. Proverbs 4:14 says to “do not do as the wicked do or follow the path of evildoers.” (See Psalm 1 for additional emphasis on this point.) Then in verse 24, we are told to avoid “perverse talk” and “corrupt speech.” These verses tell us to guard what goes into our hearts through our ears and our eyes. Wickedness, violence and sleeplessness are just some of what happens when we don’t avoid these things. Solomon tells us simply to “turn away and go somewhere else.” In other words, avoid them and simply do not give them room in your life. Don’t get sidetracked. Keeping our focus lies more than with just avoiding evil. Not getting sidetracked also means choosing to pursue good. This includes choosing to see the unseen (2 Corinthians 4:16-18), getting wisdom and using good judgment. Keeping focused means knowing the truth of God’s Word for protection against not only the accuser’s lies but also against man’s ideas and philosophies as well as against our own distortion of reality to fit our fleshly desires. In Bible times, a city without walls left the people exposed to the enemy and open to thieves. Likewise, a person without wisdom leaves his heart exposed and vulnerable. Fortunately, God always gives wisdom to those who ask for it (James 1:5), and often that wisdom comes through godly fathers, just like the advice in Proverbs 4 came to Solomon through his father David. If you have a godly father, be thankful for him and soak in his wisdom. If you don’t, know that your Heavenly Father fills that gap. If you are a godly father, are married to one or just know one, encourage him today to pursue the wisdom of his heavenly father and to share his wisdom with those he loves as David did with his son Solomon. And as this wisdom flows, boast in the giver of that wisdom (Jeremiah 9:23-24). DISCUSSION: In Star Wars, Episode II, Attack of the Clones, Dexter-Jettster says to Obi Wan, “I should think that you Jedi would have more respect for the difference between knowledge and… heh heh heh… wisdom.” How does this difference play out in the life of a Christian?